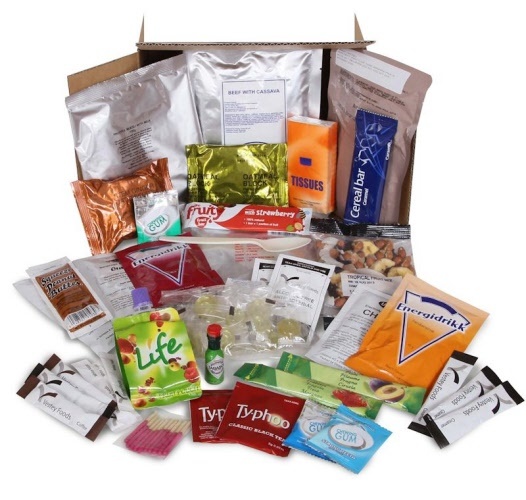 The 24 HR Ration Pack (same as army rations) contains up to 3995 calories and has 3 main meals, a dessert and a good selection of high energy drinks with snacks. This box contains everything you need to eat while out and about in the hills or jungle. Issued to the Army. Snacks- apple / peach fruit purée, oatmeal block, sesame seed bar, smooth peanut butter, roasted and salted peanuts, cheese spread. Drinks- orange flavoured fortified drink powder, orange flavour fortified powder, tti fruit flavour powder, tropical flavour, mint hot chocolate drink powder.